While much of Costa Rica has been stripped of its forests, the country has managed to protect a larger proportion of its land than any other country in the world through the formation of National Parks. In 1970 there came a growing acknowledgment that something unique and lovely was vanishing, and a systematic effort was begun to save what was left of the wilderness. That year, the Costa Ricans formed a national park system that has won worldwide admiration with roughly 25% of its’ land mass being under some form of protection today. Throughout the country, representative sections of all the major habitats and ecosystems are protected for tomorrow’s generations. The National Conservation Areas System (SINAC) protects more than 186 areas, including approximately 32 national parks, 8 biological reserves, 13 forest reserves, and 51 wildlife refuges. 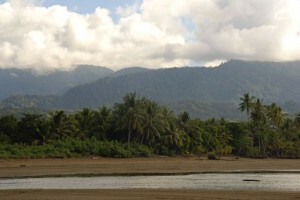 Near Uvita, along the southern pacific coast of Costa Rica, is the Osa Area of Conservation. Starting from Dominical and stretching to Punta Burica along the Costa Rica – Panama border, the area is host to 3 National Parks, 1 Biological Reserve, a variety of Mixed Wild-Life Reserves, 1 State Wild Life Refuge, 1 Wetland Reserve and 5 Indigenous Reserves for a total of 161,823 terrestrial hectares and 11,400 marine hectares under protection in Osa, Costa Rica. Marino Ballena National Park – Famous for the large number of migratory whales spotted in the Marino Ballena National Park, the most popular attraction in the area includes the unique whale watching and dolphin encounter boat tours. The humpback whales regularly pass through the south pacific oceans of the Marino Ballena National Park between mid July and October, and again in December through March, as they migrate to and from feeding and mating grounds in the north and south hemispheres to the Marino Ballena National Park. The Marino Ballena National Park brings tourists to its secluded beaches, beautiful coral reefs and tranquil waters. Created to preserve the fragile marine ecosystem and natural habitats of the marine species, it covers around 115 hectares of coastline and 5,300 hectares of ocean. Marino Ballena National Park recently was recognized by “National Geographic” as one of the best places for Whale watching in the world. Cano Island Biological Reserve – Cano Island Biological Reserve is a small island in the Bahia de Coronado (Bay of Coronado) west of the Peninsula de Osa. Attracting visitors from around the world to its beautiful beaches, coral beds, and sea life, Cano Island Tour is most famous as the best snorkeling and scuba diving destination tour in south pacific of Costa Rica. Marine life includes, but is not limited to, manta rays, dolphins, sea turtles, whales, and a wide variety of fish. Evidence of pre-Columbian human activity on the island is substantial, with some of the most interesting artifacts being stone spheres carved by early civilizations. Corcovado National Park – Corcovado National Park is located on the pacific south coast and has 54,039 Terrestrial hectares and 2,400 Marine hectares and has been called–the Amazon of Costa Rica. It is the largest stronghold of primary forest on a Pacific coastline and famous for holding 5% of the biodiversity on this side of the planet. The ecological variety is quite stunning and National Geographic has called it “the most biologically intense place on Earth”. Visitors to Uvita love the Bahia Aventuras Corcovado National Park Tour! Terraba Sierpe Mangroves Wetlands Refuge – Internationally recognized as a RAMSAR site, the Terraba Sierpe Mangroves cover 16,000 hectares of wetland reserve and Includes the estuary of the Rivers Terraba and Sierpe, and adjacent lagoons (Laguna Sierpe, Laguna Porvenir), swamp forest, sandy beaches and cliffs. It is an important habitat for many species of birds, fish, mammals and reptiles and makes for an impressive nature tour. During the Terraba Sierpe Mangrove Tour visitors will participate in bird watching and learn how the mangroves play an important role in maintaining the fish stock for the south pacific oceans of Costa Rica. Besides providing Costa Ricans and foreign travelers with the privilege of admiring and studying the wonders of nature, the national parks and reserves protect the soil and watersheds and harbor an estimated 75 percent of all Costa Rica’s species of flora and fauna, including species that have all but disappeared in neighboring countries. Costa Rica’s progressive policies on environmental protection and sustainable eco-tourism in the National Parks System have been applauded as a model for other countries. The rainforest, tropical forests, marine areas and wetlands of Costa Rica are the subject of many university and scientific organization studies. The enrichment of the world’s knowledge of these important habitats is an invaluable contribution from the National Parks System of Costa Rica. If you want to be a volunteer in one of this conservation areas of Costa Rica please contact us and we can help you.